The Council of Christian Colleges and Universities has named Shirley Hoogstra as its seventh president, following a tumultuous year under which they fired her predecessor after serving less than a year on the job. Hoogstra, a former practicing attorney turned vice president of student life at Calvin College, will become the first female to hold this position. "I'm excited for this opportunity because I am passionate about Christian education generally and Christian higher education specifically," Hoogstra said in a statement. "The world is increasingly complex, and the liberal arts education that CCCU institutions offer prepares students to understand why faith deeply matters to people. And the Christian faith gives hope and meaning when hope and meaning in life can seem illusive." Hoogstra's predecessor, Edward Blews was fired from his position in October, with little explanation from his former employer, aside from releasing a statement that said the decision had been made after "careful investigation and prayerful consideration." Blews had been named CCCU president in 2012 following an 18 month search process. In February, he sued the organization, accusing it of tarnishing his reputation and giving the appearance that he had been fired with cause in order to save $2 million. In a World Magazine report, his former colleagues described his term as "nightmarish," and alleged that the former Association of Independent Colleges and Universities of Michigan administrator berated staff, " tracked which employees complimented him, and during his first staff meeting laid out on a table dozens of congratulatory letters to himself. The Spring 2013 issue of the CCCU's 'Advance Magazine' had 18 photos of Blews." Hoogstra told The Christian Post on Tuesday that prior to her tenure in higher education, she worked at a firm where she specialized in families and personal injury litigation. Prior to moving to Calvin, she had served on the Board of Trustees and as the first alumni endowment chair. "It was a calling," Hoogstra said of her transition in 1999 to higher education. "I had a sense that perhaps God was deploying me to be used as a leader in my alma mater." 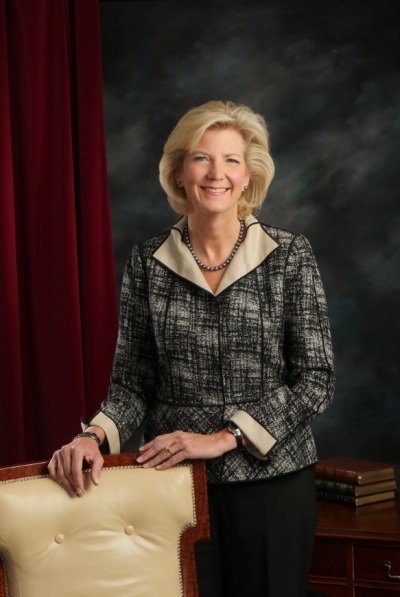 While she sees herself as a "leader first," Hoogstra noted that she hopes "to bring whatever benefits there are from being female," to leadership position from which she will advocate for 174-faith based members and affiliates. "It's really important for people to see themselves in different jobs. So if it's easier to imagine a leader who matches your gender and if it's inspiring or encouraging to women that this role is filled by a woman, I'm delighted by that," she said. "I think that God calls us all to steward our leadership gifts whether we're men or women and that's what I'm trying to do." Under interim president Bill Robinson, the president emeritus of Whitworth University, the CCCU joined the Evangelical Immigration Table and recently joined leaders from World Vision and Sojourners to call Congress to authorize additional funds for unaccompanied immigrant children. Hoogstra affirmed that one of the CCCU's primary functions was to be "good advocates on the hill." "We are for institutional autonomy, we need to be the best who we are given our mission. The CCCCU is a good conversation partner on religious liberty and freedom of conscience," she added. Andrea P. Cook, who chaired the CCCU presidential search committee and is also the president of Warner Pacific College, called Hoogstra "the right person" to lead Christian higher education through the next decade. "Like the colleges it represents, the CCCU will always operate with faithfulness to Jesus Christ, commitment to developing leaders of the future, and passion about proactively engaging the most complex issues of our time," Cook said in a statement. "Shirley Hoogstra is uniquely qualified and God-gifted to become the next president of the CCCU. It is imperative that CCCU institutions are represented by a leader passionate about our mission, savvy when considering legal and political liabilities, and grounded in Christ. Shirley is all of these."